We decided to make Seafood Risotto to have a date night in for Valentine's Day. After 15 years of marriage I know how important a date night is not only on Valentine's Day, but at least a few times a month. When the kids were little we spent many Valentine's Days putting them to bed a little early and making something a little extra special for dinner. Our kids are much older now but we still choose to have date nights in while they are gone. Some of our most memorable dates have been at home working together in the kitchen. Usually when we are making something for our date night we try to recreate a favorite we've had out. 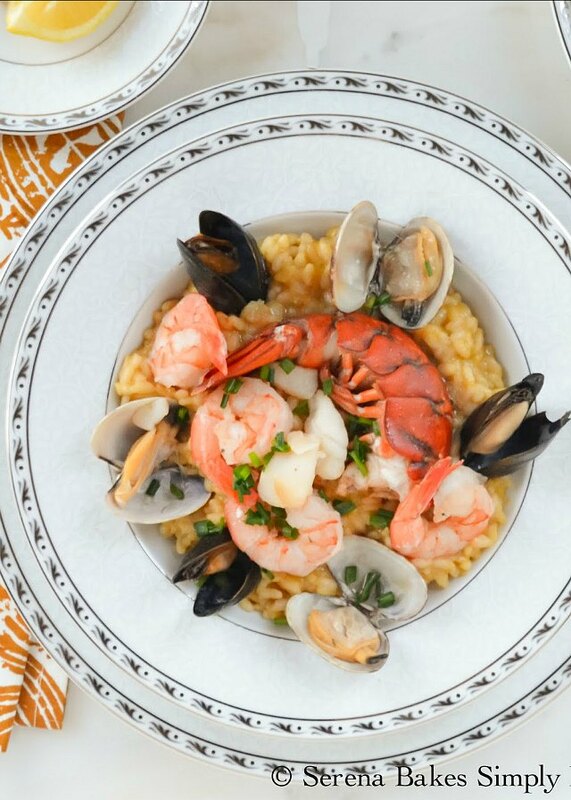 This Seafood Risotto contains all the great makings to a wonderful night. I've always found something so romantic about the creamy texture of Risotto and you can never go wrong with Seafood. In a medium-small sized saucepan bring 3 cups Good Quality Chicken Stock or Seafood Stock to a simmer. Leave simmering over low heat. In another medium sized pot add 2 tablespoons Olive Oil and 1/3 cup Minced Shallot. Saute over medium-high heat until shallot starts to caramelize. 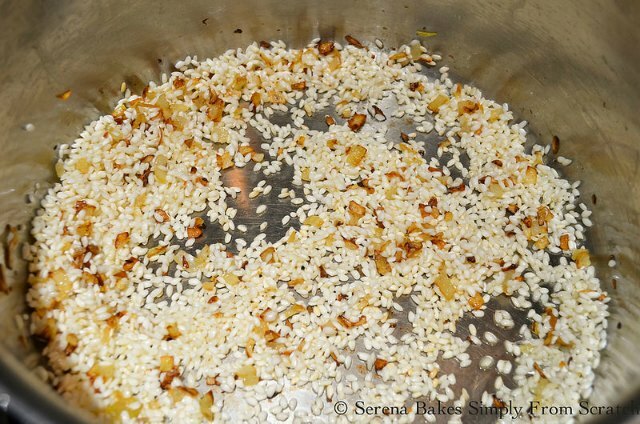 Add 3/4 cup Arborio Rice and cook for about 45 seconds-1 minutes until coated with oil and slightly translucent. Add 1/3 cup dry White Wine. Stir until wine has evaporated and been absorbed by the rice about 3 minutes. Add 1/2 cup of the Hot Chicken Stock or Seafood Stock, and stir until most of the liquid has been absorbed by the rice. Rice will look like this. 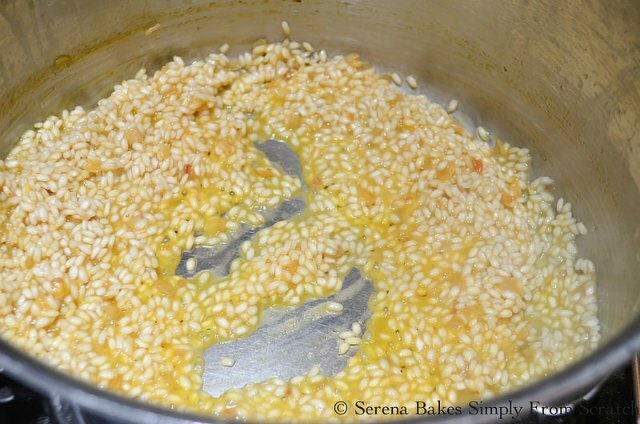 Repeat with an additional 1/2 cup Stock stirring until rice has absorbed most of the stock. Repeat until about 2 cups Stock has been added. 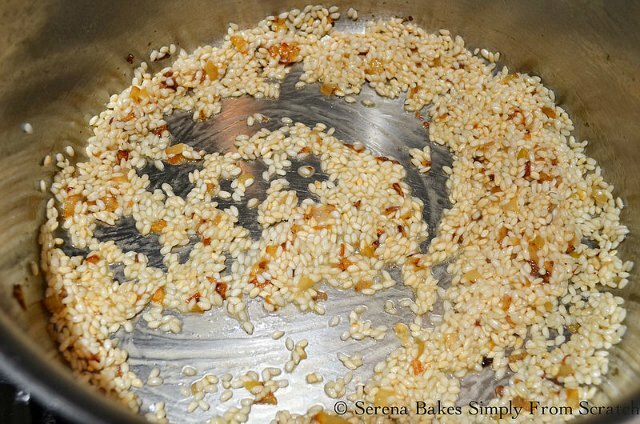 Add an additional 1/4 cup Stock, stir well and remove to a burner without heat. Cover until ready to finish. In a deep saute pan with a lid add 2 tablespoons Butter and 1 Fine Sliced Shallot over medium-high heat. 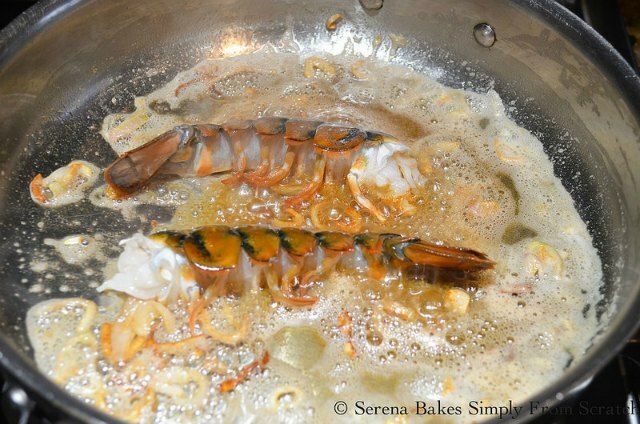 Saute until shallot starts to caramelize and add 8 ounce Lobster Tail Split In Half Lengthwise meat side down. 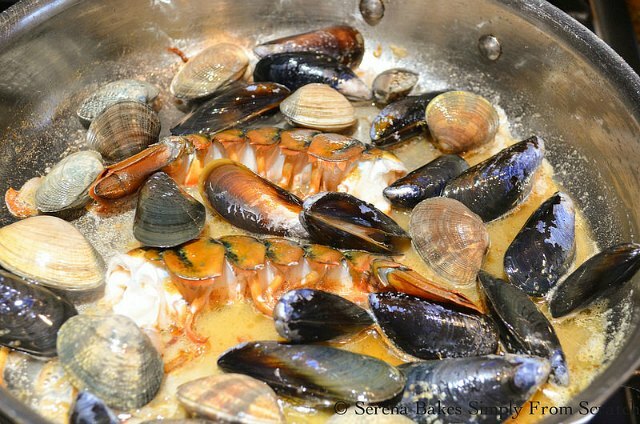 Add 1/2 cup Dry White Wine used in the Risotto, 1/4 pound Washed Mussels and 1/4 pound Washed Clams. Cover and allow to cook for about 3-5 minutes until clams and mussels open. While shellfish cooks return to the risotto. 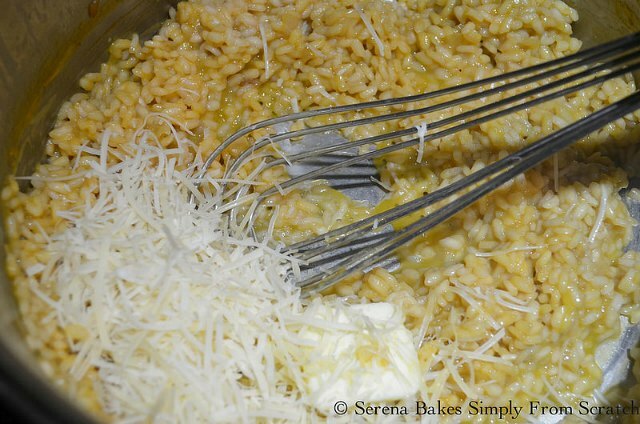 Taste Risotto for doneness and add additional Stock as needed until Risotto is al dente (tender yet firm) once desired doneness is achieved add 1 tablespoon Butter and 1/4 cup Parmesan Cheese. Stir until creamy deliciousness is reached and set aside. 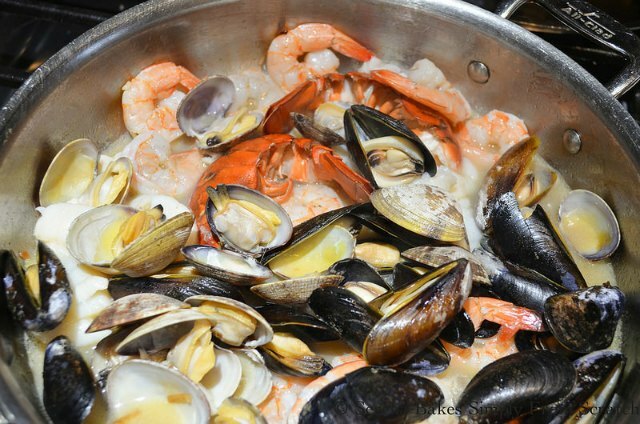 Once clams and mussels have opened add 1/4 pound Large Peeled Shrimp and 1/4 pound Scallops. Cook for an additional 1-2 minutes until shrimp are pink and scallops are white. Be careful not to overcook the shrimp and scallops or they will become tough. Discard any unopened clams or mussels. Serve Seafood over the Risotto. Drizzle with butter from the seafood pan and sprinkle with Fresh Chives and Freshly Squeezed Lemon Juice. I can't think of a more gorgeous dish for a special date night in. Creamy Seafood Risotto recipe with lobster, mussels, clams, shrimp and scallop from Serena Bakes Simply From Scratch. Heat stock over medium heat until hot. Keep warm over low heat. 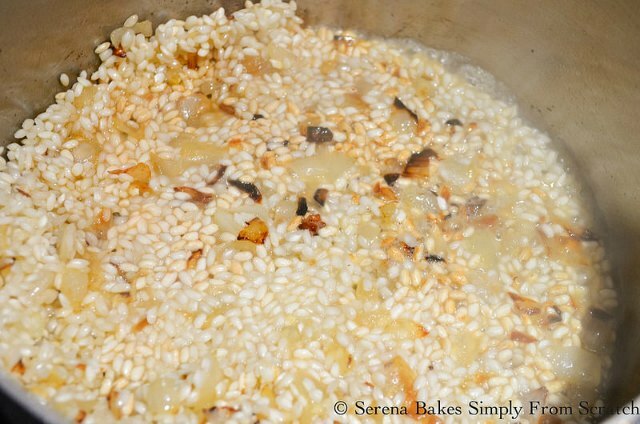 Add white wine and stir until wine is absorbed by rice about 3 minutes. Add 1/2 cup at a time hot stock, stirring until absorbed. Repeat with remaining broth until about 2 cups of stock has been added to the rice. Add an additional 1/4 cup Chicken Stock, stir well, and remove to a burner without heat. Cover well until ready to finish. In a large saute pan with a lid add 2 tablespoons butter and cook over medium-high heat until melted. Add shallot and cook until caramelized. Place lobster tail in pan meat side down. Add mussels, clams and wine. Cover and cook for about 3-5 minutes, until clams and mussels open. Meanwhile return to risotto and taste for doneness. Risotto should be tender yet firm when done. Add addition stock and cook over medium heat until desired doneness is achieved. Once tender add 1 tablespoon butter and parmesan cheese. Stir until creamy. Cover and set aside. Return to seafood and add shrimp and scallops. Cook until shrimp are pink and scallops are white about 1-2 minutes. Be careful not to overcook or the shrimp and scallops will become tough. Divide risotto between 2 plates or shallow bowls. Add seafood divided equally. Drizzle with butter out of the seafood pan and sprinkle with chives. Squeeze fresh lemon juice over the top. Best looking seafood risotto I've ever seen. What a treat for Valentine's Day or any special occasion. I love risotto. The texture is spot on for me. It's really the only rice I like to eat, and this seafood risotto is simply beautiful. Perfect for a special occasion such as Valentine's Day! These pictures are lovely, I can almost taste this risotto, Serena! This is one crazy, beautiful dish! I'm wild about risotto but have never made one with this much pizzaz. It's perfect for Valentine's Day! Just lovely! Your dish is so beautiful! I just love it! What a fantastic risotto with all the seafood! I love that you added the lobster tails!! That is stunning, I just love it. Perfect for Valentine's Day too!! What a wonderful restaurant quality recipe! Looks fantastic! What a stunning dish and perfect for Valentine's Day! What a delicious seafood risotto! This beats any dish you could get in a restaurant, and it tastes much better made at home. Great recipe. Date nights out are SO important, but this dish would make me def need a date night IN! I love everything about it! I seriously can't stop thinking about this dish since you first posted it and I love that you paired it with one of my favorite wines. My family would LOVE this! What a beautiful dish. This is just an absolutely stunning and impressive dish! Seafood Risotto is one of my favorite meals. Thank you for showing me how easy it is to make! Oh my! This is what I've been looking for. 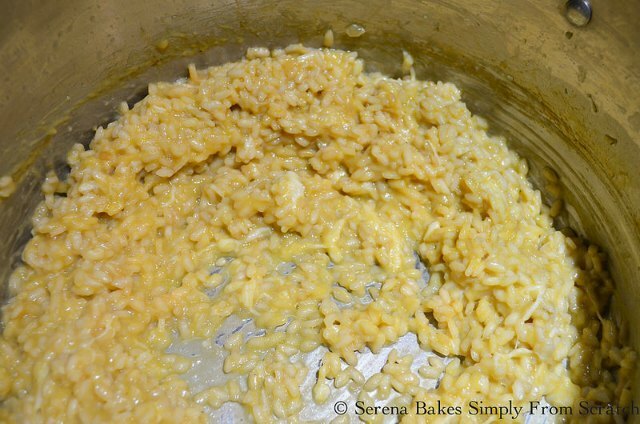 A close up look on how to make a perfect risotto. I am truly impressed with this blog post. I now know I can make one this time.